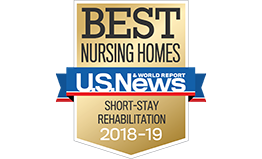 NYC Health + Hospitals/Sea View and NYC Health + Hospitals/Gouverneur ranked as “Best Nursing Homes” by U.S. News & World Report for 2016-17. Two other facilities, NYC Health + Hospitals/Carter and NYC Health + Hospitals/McKinney, also received high rankings. NYC Health + Hospitals/Gouverneur offers long-term care and support for people who can no longer manage their physical, emotional, or mental conditions at home. Our interdisciplinary teams of health care professionals develop customized care plans for each resident. Our teams of highly skilled clinicians, therapists, rehabilitation specialists and other support staff use state-of-the-art equipment and advanced techniques to help individuals recover from an injury, illness or surgery in a friendly, welcoming environment. Take a video tour of this five-star facility through the eyes of our patients and caregivers. For short-stay care, NYC Health + Hospitals/Gouverneur and /Sea View are tops. Designation for 22 patient care locations, across all five boroughs. 60 New Beds Expected to Better Serve Lower East Side Residents.